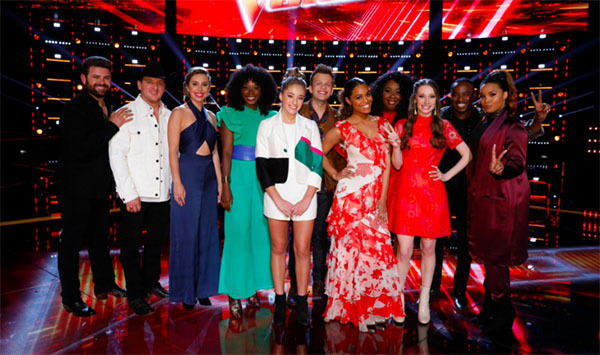 The Voice Season 14 returns with Top 11 artists live performance tonight, Monday, April 30, 2018 on NBC. The remaining Top 11 artists will perform for your votes tonight while the public voting results will be revealed on Tuesday. Each singer will sing song chosen by the viewers. Performing tonight are Brynn Cartelli and Kaleb Lee from Team Kelly; Sharane Callister, Rayshun LaMarr and Jackie Verna from Team Adam. Last week, DR King from Team Kelly was eliminated from the show. Keep locked on this page, The Voice 2018 Top 11 live performance show recap and videos will be posted on this page once available online. “You’re so great and entertaining and you are connecting to the audience,” said Kelly Clarkson. “I felt the softer side. You have so much moment building on the show right now. That set you on the top,” said Blake Shelton. “I just feel such a connection to you in so many levels. I feel you finding the footing of who you are. You did it so beautifully in your way,” said Alicia Keys. “I was a little afraid for you doing that song. I’m prod of you for tackling that song in your own way and your own style. You crushed it,” said Adam Levine. “It is perfect for your voice. It shows your energy and your range,” said Blake Shelton. “You have this crazy awesome rock and roll tune. You did a killer job, nailed it. I love it,” said Kelly Clarkson. “You had the best song and the best performance. it was perfecta and it was amazing,” said Adam Levine. “You do understand the power and sensitivity. You are amazing how you create this energy effortlessly,” said Alicia Keys. “That song was so perfect for your voice. When you held those notes, that song work for you well,” said Blake Shelton. “You are more dynamic and better. You are one of the best singers, you do it so classy. It’s flawless,” said Adam Levine. “I can’t take you, you are so phenomenal. You are inspiring so many people that you can completely owned your own space,” said Alicia Keys. “You stepped out of the background. You are dominating this show this season,” said Blake Shelton. “You are so unbelievably lovable. You showed America that you are a unique artist, one of a kind. You are incredible,” said Alicia Keys. “You are so captivating. You’re just cool and your vibe is amazing. It is infectious, you are so beautiful and so talented,” said Kelly Clarkson. “You are not a joke. It’s just you and your voice, your music, your passion and quietness. You murdered it,” said Alicia Keys. “It’s crazy how big your voice is. You did such a great job on that,” said Kelly Clarkson. “You are so important to country music. Your voice is powerful,” said Blake Shelton.